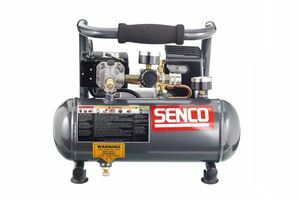 Besides running air tools, a compressor can be ideal for cleaning out dirty fuel lines, blasting debris out of inaccessible spots and pumping up tyres. They often don’t require much maintenance either. To help make it easier to pick a compressor, here are ten of our favourites. This compressor is a great entry-level choice. It’s not too big, has an adequately sized 24-litre tank, a stout 2.5hp motor and a 9.6 CFM airflow rating. 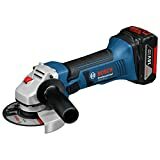 This means it’s ideal for running air tools and pumping up tyres – but if you want to use it for spray painting, or heavy-duty work, you’ll probably want to consider something with a higher CFM rating and a bigger tank. Still, given that it costs well under £100, it’s hard to complain. 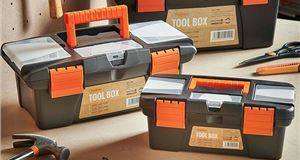 Many compressors don’t come with any tools or accessories, meaning you’ve got to pay more up front before you can even start using them. 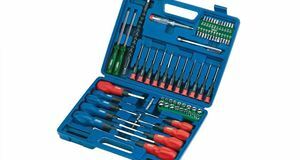 This Sealey offering, however, comes with several extras – a spray gun, tyre inflator, air gun and air hose – so you can get started right away. It’s not overly expensive, either, and has a 50-litre tank, a 2hp motor and a 4.6 CFM airflow rating. As a result, it’s best suited to light-duty applications. If you need a light-duty compressor that’s quiet then this Mader unit should be on your list, as the manufacturer claims it operates at just 69dB – whereas, for comparison, the aforementioned SGS compressor punches out a deafening 97dB. 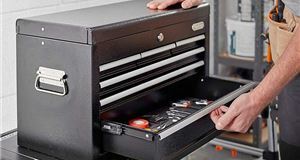 This is best suited for light air tool use and hobby applications, though, as it only has a 24-litre tank, a 0.75hp motor and a 3.6 CFM rating. 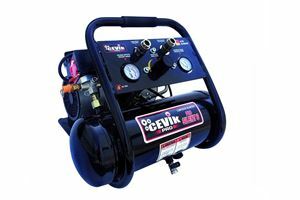 Those needing to use their air tools away from the workshop will need a portable compressor, such as this Cevik unit. It’s compact, comparatively light at 17kg, and easy to pick up and move around. It’s admittedly not that capable, packing a 1hp motor, a six-litre tank and a 3.9 CFM rating, but it’s ideal for light remote work. 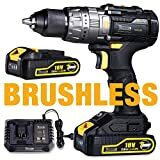 You can also run it up inside, disconnect it from the mains and still use its compressed air – making it ideal for topping up tyres or similar. Conventional air compressors are all well and good but they do have a large footprint. 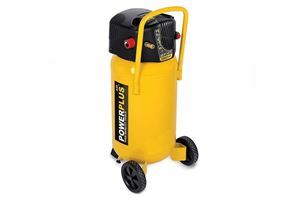 However, numerous vertical compressors – such as this Powerplus unit – are available and they’re ideal for smaller garages and workshops. This ‘X1750’ packs a 2hp motor, a 50-litre tank and a 7.8 CFM airflow rating. It only has one outlet, though, so you’ll either have to change lines or tools over when you need to do something else. The Mader compressor is ideal for hobby applications but it’s still quite a big, heavy unit – which could be a problem if you need to move it from time to time. This Senco alternative is more expensive but it’s less than half the weight of the Mader and smaller, making it far easier to transport. Its motor puts out 0.5hp and the compressor puts out just 1.2 CFM, and it’s only got a small 4.6-litre tank, but its improved portability could prove useful to some. 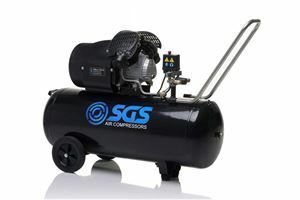 If you’re looking to occasionally use a spray gun, for applying anti-corrosion fluid or paint, then you’ll want a compressor such as this SGS offering. It has a large 100-litre tank, for starters, so the compressor doesn’t have to run as often. 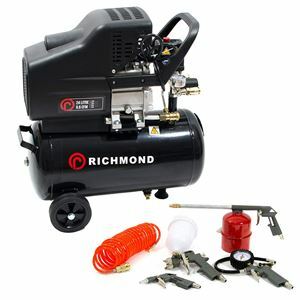 It also packs a higher 14.6 CFM airflow rating, making it better suited to spray-painting jobs. It also has twin outlets, but you only get a two-year warranty. 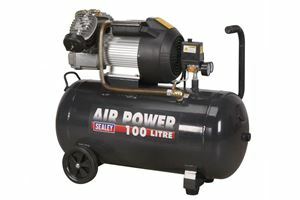 This Sealey compressor is a more affordable alternative to the Wolf compressor. 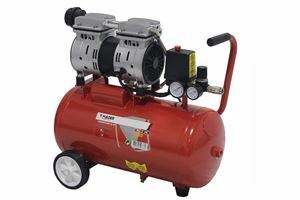 It has a powerful 3hp motor which drives a two-cylinder compressor directly, so there are no belts to snap. 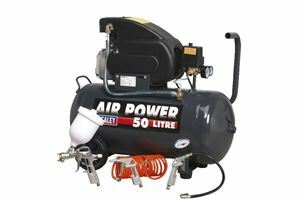 A 100-litre tank should ensure that the compressor doesn’t have to run continuously, while a sensible 8.8 CFM air delivery rating means it should cope with light-duty spray jobs. It still clocks in at a hefty 53kg, though, and it only comes with a one-year warranty. 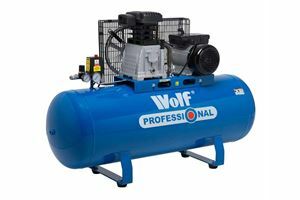 Those needing something more industrial should consider this Wolf compressor. It has a big 150-litre tank, a powerful 3hp motor and a twin-cylinder compressor that puts out 14 CFM. 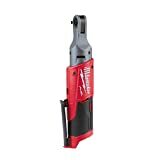 This makes it ideal for spray painting, or operating heavy-duty air tools. 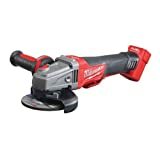 It has twin outlets, too, so you can run two tools simultaneously. This compressor weighs almost 50kg, though, so it’s not something you’ll casually cart around the workshop. A two-year warranty is standard. 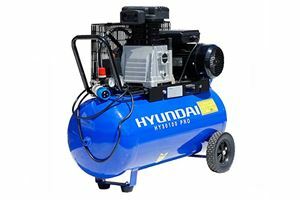 If you need something more capable, and have a bit more to spend, then this Hyundai compressor could be ideal. It has a 100-litre tank, a stout 3hp motor and a two-cylinder compressor that puts out 12.5 CFM. Consequently, it’s capable of supporting more intensive operations such as spray painting. It comes with a long three-year warranty, too, and has twin outlets to cut down on hassle. It also has wheels, so moving it around is less arduous.